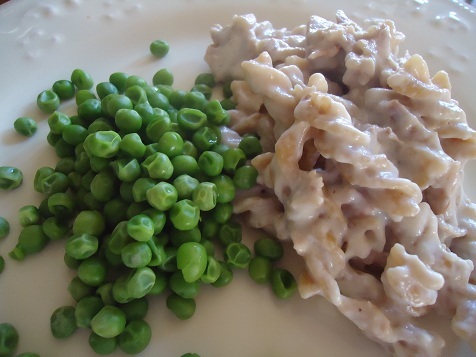 Healthy, Inexpensive Lunches – What Are Your Favorites? In the past, I’ve shared with you that our family does not eat many sandwiches, unless we’re on the road. Why? Because my family of six knows how to put away a large amount of food three times a day. By the time I purchase a decent quality lunch meat, whole wheat bread, and mayo I feel good about feeding our family, I can spend between $15 and $20 just on sandwiches for one meal. I could spend less if I bought cheaper lunch meat, but I don’t wanna and you can’t make me. ;) Thinking about how lunch meat is processed, and knowing what is added to the meat makes my face curl up in unattractive ways. It is best if I don’t go there. Instead of sandwiches, our family enjoys much less expensive, much healthier meals during lunchtime each day. In an effort to share my ideas and get new ideas from all of you too, I thought it might be fun for us to talk about our favorite healthy (and quick) lunches. 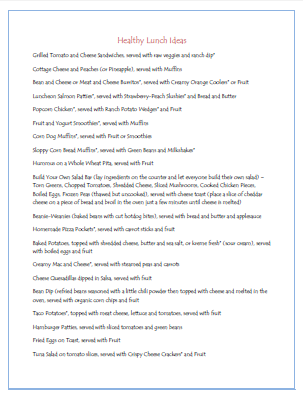 Look through my archive of menu plans to read through lunches we fix regularly. As long as I have a plan, I can typically get lunch on the table very quickly. Don’t assume that sandwiches are faster to make than other lunches. Be creative and have fun. And take advantage of these Make Ahead Meal ideas which make warming up a pre-prepared healthy lunch a snap. In case you don’t have this yet, we’d love for you to download our FREE Healthy Lunch List. Just click, print, and place this list on your fridge (or another handy location) to give you lots of fun lunch time inspiration! What are your favorite, healthy lunches? Load up the comments section with ideas for us to draw from! Is there any way you could make your lunch list bigger? When I click on it, it comes up really, really small. Thanks! I’ve been looking for more ideas one to cook for our family! Yes, I originally had the link the the download only on the words “Healthy Lunch List”, but I went ahead and coded it into the image to for others who click on that, it should come up as well. Thanks! Yaki mando done as egg rolls, it takes very little extra work to tripple the batch and freezing them. We love breaded zucchini and applesauce. We mix instant flavored potatoes with Italian bread crumbs for our breading and we dbl bread. Instead of frying, we found they can be baked in my stoneware. Love to eat them cold for lunch or breakfast. Stuffed burgers: frozen bread dough thawed. In large bowl mix 2-3 pounds ground beef/turkey… Chopped onion, shredded cheese, relish, mustard, worchester sauce, ketchup. We pinch off pieces of dough and shape into 5in circles. Place a handful of burger mix in center of circle and pinch dough to cover. Bake at 350 degrees for 30 minutes or until golden. Can also make as taco meat or sloppy joe. Great to grab and go. We love breaded zucchini and applesauce. We mix instant flavored potatoes with Italian bread crumbs for our breading and we dbl bread. Instead of frying, we found they can be baked in my stoneware. Love to eat them cold for lunch or breakfast. If you use fresh ground salt/pepper you will use less if you add to breading mix. Thank you for this post… I was just thinking that we need some good new lunch ideas and this will help!! P.S. That noodle stir fry looks wonderful! Oh, I was just working on my June meal plan. I’ve been lacking inspiration in the lunch department so this is right on! We generally have either leftovers, salad with a hard boiled egg, PB&J or bean and cheese quesadillas. Or taco bowls. 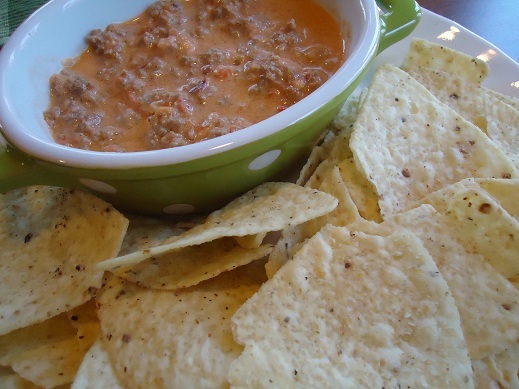 Most common here, (1 adult a 16 yr old boy, 15 yr old girl and 9 year old girl-i send hubbydear to work with fresh cheese, jerkey, trailmix, and fresh fruit) tortillas chips with cheese shredded right on top, put on a cookie sheet and broiled until melted then we dip in salsa also serve with frozen fruit smoothies (bananas, strawberries, yogurt, honey, vanilla, and whole milk) or we do fresh stovetop popcorn with the smoothies! Those are our favorites and way cheaper than a frozen pizza and chips. Also, I just love this sight, thank you for all the time and energy you put into this! Chicken salad, tuna salad, pasta salad (stir in salmon, tuna, or chicken to make it more filling), or eggs. Sometimes, during the cold months, I will make a pot of chili or spaghetti that is specifically for lunches, since it packs well in my husband’s and children’s lunch boxes, and I know they will like it. Soup. I like to make a big pot and have it for several days, plus freeze some. There are so many different soups to make, and it’s usually pretty healthy and affordable. And it’s really good with raw veggies and slices of cheese. Leftover mexican meat – taco meat, shredded chicken, etc., is great for making nachos or quesadillas. We also grill lots of meat, then slice up the leftovers so they reheat well and make all kinds of quick lunches with it. Sometimes just chunks of chicken are a nice main dish. As you can see, I like to make a big pot of something, and then use it for several days in different ways. It seems like ethnic cooking, which usually means mexican for us, really works well for this. I usually use Applegate hotdogs that I buy from our health food co-op, Azure Standard. I use Bistro Naturals. Love them and they are a bit over $4/pkg. 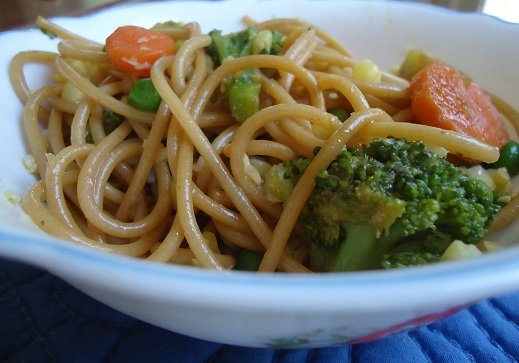 One of our favs around here for my little one is “Veggie Noodle” I just boil spaghetti noodles in veggie broth, with oregano, and basil, or italian seasoning if I’m out of the two above, and the last few minutes or so I add frozen mixed vegetables. Then I scoop out the noodles and veggies and put shredded cheese on top and pour a little of the broth from the soup on it to melt the cheese! You don’t have to scoop it out, but I don’t let my little one have a ton of broth because she likes to drink it and dump it! It’s really good! Another one she really likes is spinach Dias. All it is is frozen spinach on a tortilla wrap with cheese, just bake until the spinach is cooked through. cook on a low temp so the outside doesn’t burn. Some of our favorites are hummus and pita chips, macaroni and cheese with evaporated milk instead of heavy cream, wraps with cream cheese and preserves or fresh strawberries, wraps with peanut butter and bananas, and mini-muffin meatloaves. How about baked potatoes, topped with taco meat, shredded cheese, sour cream. I like to bake extra to have on hand for lunches. Corn on the cob, guacamole with tortilla chips and cheese. Thank you for all your yummy ideas! Your pizza pockets are what we’re having today with fruit and veggie. I make up a huge batch of your Popcorn Chicken. Freeze it on flat cookie sheets. After it is frozen I transfer it to a large Tupperware container. The we cook as needed. 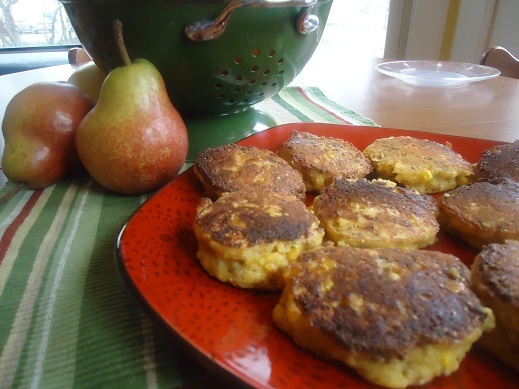 I bake a large batch or pan fry (my husband LOVES this) a small batch! I admit I use store-bought sandwich bread, but I would love to make bread for sandwiches. Anyone make a healthy bread that works great for sandwiches? My homemade whole wheat bread is yummy, but after about a day, it’s dry and crumbly. I’ve heard that adding vital wheat gluten helps. Anyone used that? Or is it not good for you? Any tips? Lyss, I use the recipe off of the family homestead website http://www.thefamilyhomestead.com/breadbaking.htm. Its really soft and never crumbly.I do have a bosch mixer and it makes 5 big loaves. Then I just freeze most of them and pull out as needed. If you dont want to make that many she has several other great recipes. They do use vital wheat gluten which may be why its softer too. Also I notice that the white wheat is a little softer to work with too. Hope this helps. but her loaves were dry in a few days. applesauce. I ate some of her new bread, and it WAS better! I have issues with lunchmeat as well if I am in a jam I will buy it. However, I have started roasting whole turkey’s ,chickens or a turkey breast and that is what I use in place of lunch meat in my children’s lunches. What a great post! Its always inspiring to me to read what other people are making their families for lunch. This is an area I have struggled in the past to make healthy and frugal. I was spending so much money on lunch stuff like bread, meat, peanut butter etc. After finding this site and a few others I have made some wonderful changes. Since I have 3 children in school I have to make their lunches portable. One of the first things I did was to start making my own bread. I love knowing that there is only a few ingredients in it as opposed to 50 (or so) that was in my store bought bread. I make 5 big loaves at a time and then freeze all but one and pull it out throughout the week. I also assigned each day a theme like I do for my dinners- so now Monday is pizza pocket day (using Laura’s recipe)I just bake them and wrap and freeze. I pull them out the night before and by lunch time they are great. Tuesday is sandwich day-mostly good organic peanut butter or sunflower butter with all fruit jam. Wednesday is pasta day and I usually boil whole wheat noodles served with red sauce and some cheese or make Laura’s homemade mac and cheese. (I use the divided lunch containers for this) Thursday is “lunchable” day. I serve Akmak crackers with cheese and nitrate free meat. Friday is wrap day. I make a batch of whole wheat tortillas and usually put egg salad or hummus and veggies inside. All these meals I serve with fresh veggies and fruit. It has been a learning process for me. I really feel its been worth it though. Thanks for all the great tips that are always encouraging me on this website! Stuffed potatoes using spinach or broccoli, spinach quiche, your quesadillas, homemade crackers, cottage cheese, fruit, pas at salad, and lots of items on your list. Some of our favorite lunches- homemade pizza, veggie pizza (homemade crescent roll dough, baked, then topped with ranch-cream cheese mix and lots of chopped veggies), mexican skillet rice, wraps, stroganoff, hamburger-macaroni skillet, tacos, chili-cheese fries, soup/chili, pot pies (make in mini pie tins and bake straight from the freezer). I also do a lot of pasta dishes- homemade mac & cheese, lemmon-pepper pasta, alfredo, tomato-basil pasta, chicken/cabbage/bacon pasta, pasta with peanut butter sauce, etc. They can all be loaded with veggies and use leftover/small portions of meat. For sandwiches, we do pb & j, shredded turkey, bbq beef, or a stromboli. Leftovers are always first pick though! Thank you so much for this! I get in such a lunch time rut! I have a 1 yr old, 3 and 4 year old so it’s hard to come up with stuff for them at times…and just like you I hate buying lunch meat…and I am not a fan of PB&J too often either! Thanks so much, I can’t wait to start making these!!! My husband will be happy for a change of food too!!! I make a huge pot of vegetable soup nearly every week and we eat on that a lot. It’s a great way to get tons of veggies in. That chip dip looks amazing though. I’m definately going to have to treat us to that sometime soon. Some great lunch ideas- another way to cut cost is with coupons. If you are interested, we have some great resources for free coupons and a system for using them most effectively. Stop over please and leave your comments. We love Lentil Stew. This is a recipe adapted from a website I found called Large Family Logistics. She has a Crockpot Lunch Menu Plan link on the left side of her website for more easy ideas. We have a big family and my 9 year old son makes it on Monday and we eat it for lunch for a few days. We use a 7 quart crockpot but it could be halved and it would still make enough for a few lunches or individual servings for the freezer. If I have a ham bone – I toss one in – makes it extra good. Cook on high for 3-4 hours in the morning. It is ready by lunchtime! Top with cheese and serve with carrot sticks. I’m sorry but these are not healthy lunches. So much corn! And in most cases I am sure it is GMO corn I bet. So much starch and not enough greens. 85% of the corn in the united states is GMO and it is not on the label when food is GMO… So it is very likely that the corn you use (whether it is corn meal, corn chips, etc.) is GMO. Even if it was not a diet with as much corn as you have listed here is quite unhealthy. I’m sorry, your lunches sounds very tasty and inexpensive. They are creative and cute; but they are in no way healthy. Fried foods and beef are the two unhealthiest things you can eat. I could talk in detail about all the recipes you have here I think you get my point. Please don’t label things as healthy when they are not. It is misleading and I am sure a lot of people who read your blog respect and listen to your oppinion. Thank you so much for this! I know you have said before yall don’t eat many sandwiches for lunch- and that’s usually all we eat, or left overs. So I really, really look forward to trying some other recipes for lunch (because sandwiches are expensive! ).